Introducing two roundabouts at the intersections of Preston Road, Armstrong Parkway-Avenue, Oak Lawn Avenue, and Lakeside Drive would save motorists 34 seconds on average during morning commutes, according to a recent analysis. 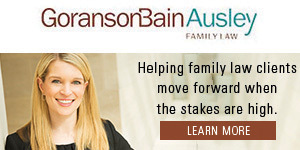 The savings in the afternoon would be even greater – 47 seconds. 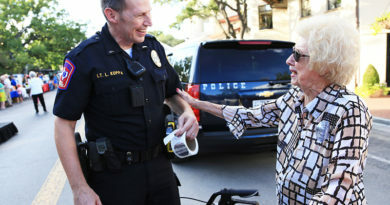 But the cost of such a major rebuild of those intersections – potentially $4.68 million – combined with the learning curve for motorists accustomed to how those intersections work now has Highland Park leaders leaning toward more expedient approaches. “To save 34 seconds is expensive and painful,” Mayor Margo Goodwin said, adding she wouldn’t want to have to explain to displeased motorists why the town had made such drastic changes. Director of engineering Lori Chapin explained that the town originally planned to do street resurfacing, concrete repairs, and minor signal modifications at Preston and Armstrong during the third phase of the Preston Road project. However, in recent years the potential scope expanded to include the overall efficiency and safety of the area where Preston, Armstrong, Oak Lawn, and Lakeside meet and reducing “cut through” traffic on neighboring streets. 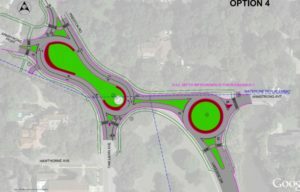 Dallas County agreed this summer to contribute more than $1 million to solutions that incorporated roundabouts, and such a project could qualify for millions more in Texas Department of Transportation funding. With substantial state funding, the town’s share of the cost could be the same as for signal upgrades and street resurfacing, but involving TxDOT would delay the project for three-to-five years and require substantial time from town staff, officials said. Town administrator Bill Lindley said staff doesn’t get many complaints about the intersections, which have seen few accidents, none fatal. She favors the staff recommendation to proceed with concrete repairs, street resurfacing, and signal upgrades – even though that wouldn’t address average morning delays of 70 seconds and 86 seconds in the afternoon. The six-month project would cost $1.2 million. With county contributions, the town’s share would be about $660,000. 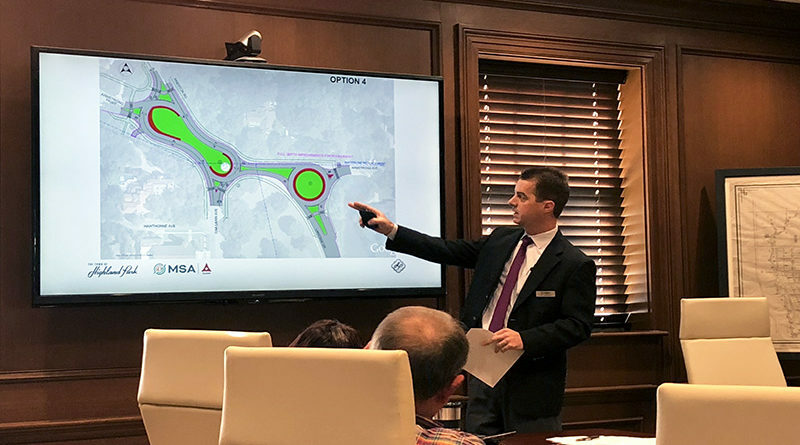 But Mayor Pro Tem John McKnight said he could see merit in an alternative that would construct one roundabout – where Lakeside and Armstrong meet – because that option, after state funding, could cost the town only about $300,000. It would reduce average delays by 24 seconds in the morning and 33 seconds in the afternoon. A decision was delayed until after council members David Dowler and Jimmy Grisham – who missed the most recent discussion – can be briefed on the issues. 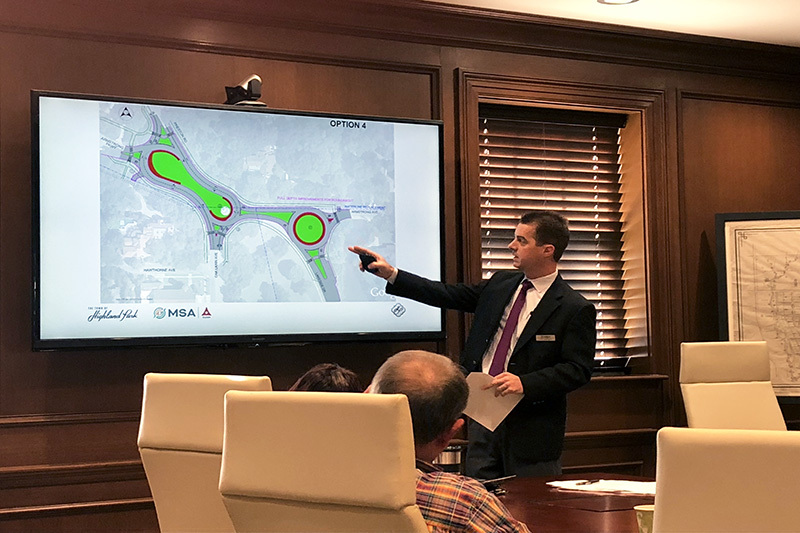 Consulting engineer Jay VonAhsen of MSA Professional Services said roundabouts are safer for pedestrians, in part, because motorists slow down when approaching an intersection instead of speeding up to beat a signal light.